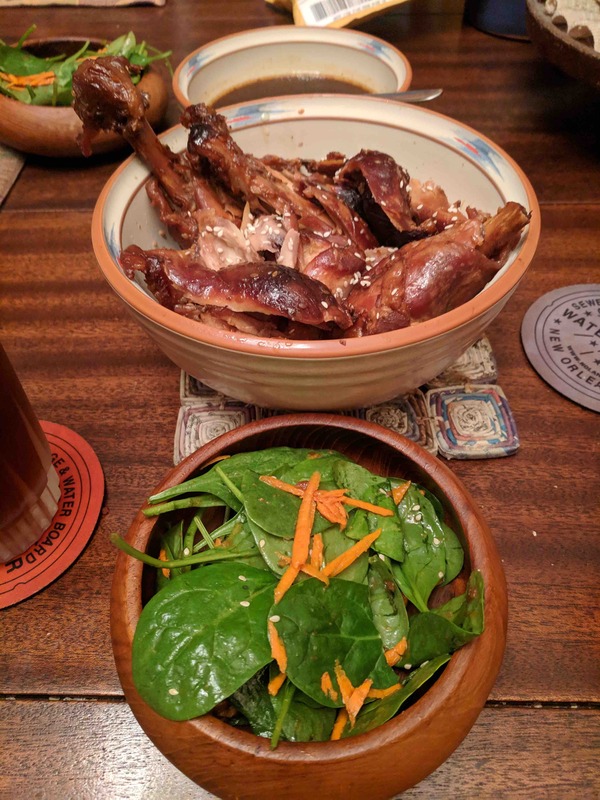 I bought a 10 pound bag of leg quarters and butchered the contents – grilling the thighs and setting the drumsticks aside for dinner during the week. I decided to use the slow cooker so it would cook while I’m at work. When I came home, I just had a few more things to do (make rice, thicken sauce, etc) to get it on the table. Further, the slow cooker gave time for the connective tissue in the drumstick to melt away to make for falling off the bone, tender meat. 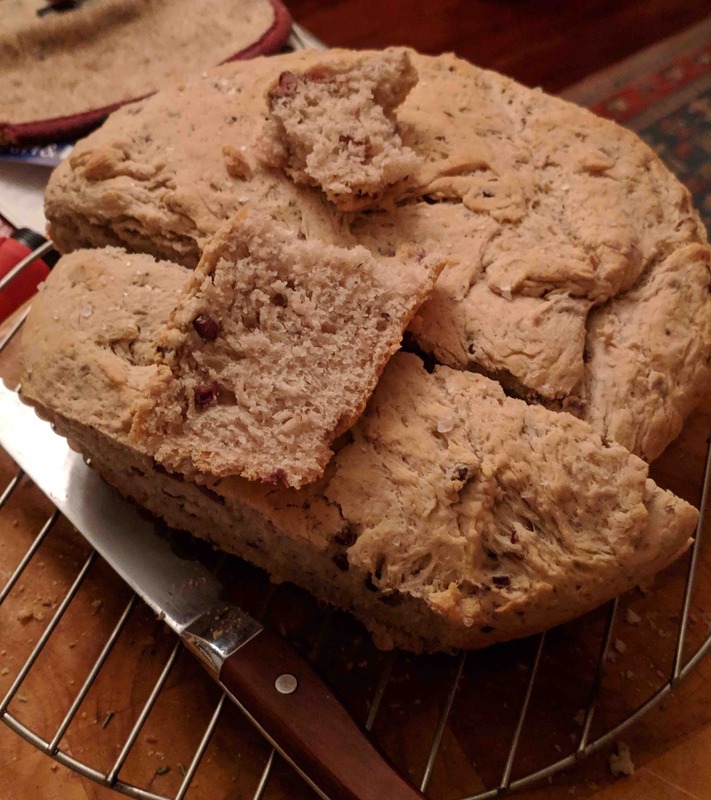 It took me a few times to get this recipe ready for posting – I originally left the skin on and it came out rubbery, even after I put it under the broiler. This version delivers tender, well flavored chicken that is reminiscent of take-away, sesame chicken. Because I was using the chicken from a 10lb bag, I doubled the marinade (but not the sauce) to ensure plenty of flavor. If you’re using less than 10 drumsticks, just use the recipe as written below. Don’t worry if you have leftovers – it makes really terrific chicken salad! Whisk together the honey, soy sauce, garlic and oil. Remove the skin from the drumsticks and place them in a zip top bag and add the marinade. Massage the marinade into the meat and place in the refrigerator overnight. Place the chicken drumsticks in the slow cooker and discard the marinade. Combine all the cooking sauce ingredients together and pour over the drumsticks. Set the slow cooker on low for 3 to 5 hours or until chicken is cooked to 165 degrees F. If you’re around, about midway through cooking, turn the chicken to coat with more sauce. When the chicken is done, pour the sauce into a saucepan and bring to a boil. Simmer until thickened. Baste chicken and serve the remaining sauce at the table. I served this with white rice and a spinach salad with grated carrots. Whirl everything together in a blender at least four hours (and up to 5 days) before using for the flavors to meld together. Pour over baby spinach leaves and grated carrot and toss. Store any remaining in an airtight container. Thanks to my guinea pigs, Michelle, Charlotte, Linda and Robert, for coming over and helping me refine this recipe and eat all the food! I was in a yeasty mood when I spied a jar of Kalamata olives in the fridge. Perfect to do some olive bread. This is great bread with soup, plain dipped in olive oil or to make sandwiches. For day two, I made sandwiches with some turkey breast brought to me by my sister from Bates House of Turkey Restaurant outside of Greenville, Alabama. Combine water, honey and yeast. Let sit for ten minutes to activate yeast. In the bowl of a stand mixer, add 1 cup of flour and salt; whisk to mix. On low speed, stir in yeasty water. Mix in olives, 2 tablespoons of olive oil and garlic powder. Switching to the dough hook, add remaining flour, one cup at a time, mixing until thoroughly combined. Let the machine work the dough for 5 minutes. The dough will pull away from the sides of the bowl but will still be very sticky and loose. Transfer to a large, well oiled bowl. Cover and set in a warm spot to rise for at least 1 hour or until doubled in size. I placed the bowl in the cold oven with the light on. Add a tablespoon of olive oil to a 10-inch cast iron skillet. Coat bottom and sides of skillet with the olive oil. Transfer dough to prepared skillet and shape into a disk. Cover with a towel and let stand for 30 minutes on the counter. Brush remaining olive oil over the top of the dough and sprinkle with coarse salt. Score the top of the loaf three times with a knife. Bake the bread for 30 to 35 minutes or until top is nicely browned. Remove from oven and turn the bread out onto a wire rack to cool. It is important to take the bread out of the skillet immediately or it will trap moisture and become soggy.